Sarah is already feeling overwhelmed by the holiday season and has a great post about slowing down. She shared her favorite Christmas cookie recipe, which she calls cheater Christmas cookies. 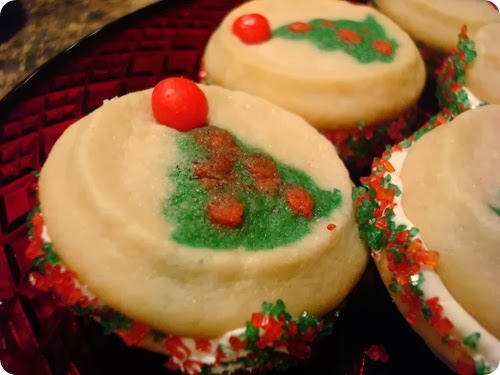 It is her way of dressing up Pillsbury Christmas cookies and it is brilliant! I might even employ the same method for decorating cupcakes. Just frost the cupcakes and stick some sprinkles and a Christmas tree cookie on top!! Quick and what kid wouldn't love getting ac upcake AND a cookie! You can check out Sarah's cheater Christmas cookie recipe (and other easy tips for holiday parties) over at Thrifty Decor Chick.